Within even the most crowded urban settings, the most charismatic of trees stand tall. 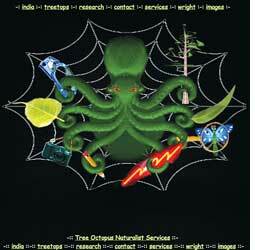 tree.octopus.net is an attempt at an online illustrated compendium of landmark trees in India. The brainchild of American naturalist Yoav Bar-ness, it lists India's tree wealth, from snowy cedar forests to humid mangroves. It has the usual suspects like the famous Bodhi Tree at Bodh Gaya and the Giant banyan at Kolkata's Botanical Gardens. There are lesser known details. The Golden Temple of Amritsar is built around a ber tree known to be 450 years old. At the tomb of the 16th century musician Tansen in Gwalior, a tamarind tree has leaves reputed to have the magical property of bestowing a clear voice.